Note taking is a big topic among educators. How do we teach it to our students? What are the best methods? Is digital note taking worse than taking your notes on a piece of paper? I am a big advocate to “if I want to teach it, I have to experience it”. Below, you will find my documentation of note taking methods I have used (at conferences) over the years (2003-2015). From solitary notes on paper to digital sketchnotes shared on Twitter and this blog. the level of transformation, in terms of amplification, shareability, hyperlinked writing, usage of different areas of the brain, etc. 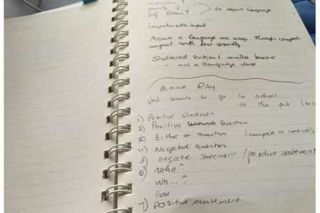 Taking notes at a conference, looked like the one I took at a World Language conference around the year 2003. See the photo below. This was years before I started blogging and tweeting. Then my blog came around and I started to share my notes a well as blog live during sessions, see below the example from 2008 and notice the lack of any hyperlinks beyond to the presenter’s website and a book recommendation on Amazon. In April of 2014, I started experimenting with Sketchnoting. I am wrapping my mind around, not necessarily WHAT to sketchnote, but around the benefits of sketchnoting AS *something* . I looked at sketchnoting as a form of reflection and know am looking at Sketchnoting as a tool for Note Taking. The three examples below are my notes from the keynotes at ASCD Camp Connect21 from this past week. Other sketchnoting examples from different conferences: BLC 2015, Making Learning Visible, Miami Device 2014, GIN Conference, AASSA- Educators’ Conference 2015.
the act of “coloring” (filling in block letters or objects) gives me time to think deeper and longer about the meaning. choosing colors adds another dimension of organization, hierarchy and connectivity between concepts and ideas. the act of thinking about the visual representation of a point or concept adds depth to understanding that point or concept. I believe there is room for all kinds of note taking methods for ourselves and for our students. We (teachers & students) just need to have several methods in our toolbox and experiment with the ones, we might not have had exposure to in order to be aware of potential benefits. How has your note taking evolution looked like?